So I have a lot of friends that are real estate professionals – and by professionals I MEAN professionals. These people pride themselves on their work and reputations which – I have learned – is really all you have in this business. It really bothers me that, as a whole, real estate people are not highly regarded. They are looked at negatively for their lack of knowledge, professionalism, and ethics – and for many, these stereotypes are well-founded. Which is why good real estate professionals really shine. Having worked with so many over the last six years or so I am confident that I can sniff out good ones vs. bad. So I deal with it. Today I am having a rough day as part of what I have going on is that I am looking for a new apartment in my neighborhood for my growing family. So I do what many do and from time to time I go up to Craiglist and see if I can find that one gem of an apartment we all dream about. We’ve all heard the stories of our friends who found some awesome digs up there. It’s the dream – at least around these parts. The problem with Craigslist, in case you don’t already know, is that it’s essentially the wild wild West. It is, for the most part, completely un-moderated. You can flag things for abuse or mis-categorization and they might be taken down but there are no real ramifications since you can always just set up another account if and when they suspend yours. It’s a true buyer beware environment. They have their issues but it works well enough, if you are a smart consumer, to avoid any real backlash and you can get a good bargain a lot of the time. I think, however, it may be time for Mr. Newmark to consider raising his fees – at least for real estate. The problem with using Craigslist for looking for a place to live is that there is a ridiculous amount of noise up there. In a climate where agents and brokers have to pay big premiums for ads on sites like Zillow, Trulia, and Realtor.com, I can see the immense appeal of Craigslist who charges minimal fees. There are several products out there that will actually plug into Craigslist and help real estate professionals leverage the platform to get their listings in there for everyone to see. And since the listings automatically expire the system stays pretty clean, right? No. Actually all that does is motivate people who want to game this system to schedule programs like this to auto-repost their listings regardless or their status because the system just does what you tell it to do. What is a bit more frustrating is that users will post different variations of their listings in an effort to come up in other searches done on the site. Now, don’t misunderstand me here, you don’t need one of these systems to do this. In fact, you can just copy and past your ads up here the old fashioned way – it’s just much less efficient. And also, don’t assume that the goal of using Craigslist for real estate is to actually move a piece of property – it’s really used much more, in my opinion, to generate LEADS……that’ ain’t right. I can’t tell you how many times I have called on an apartment that has been listed moments ago to hear, “Yeah, we just rented that – but I have something just like it for 50% more money.” Heartbreaking. And really, that’s not the spirit of Craigslist. It’s more about consumer empowerment and disintermediation. Consumers are not there at the pleasure of marketers up on this site. In fact, it’s quite the opposite. So when people such as me go up on Craigslist to find something, they expect that the people up there are at least TRYING to do business. Most everything I see up there for real estate is so poorly put together that it’s, quite frankly, offensive to a consumer. Below are some results from a search that I did for apartments in my area with a condition that I didn’t want to see any results from a broker that charged a fee. Hey, if I am going to find a gem, wouldn’t not paying for it just sweeten the story? What’s supposed to be returned are rentals from owners and owner paid (OP) apartments. 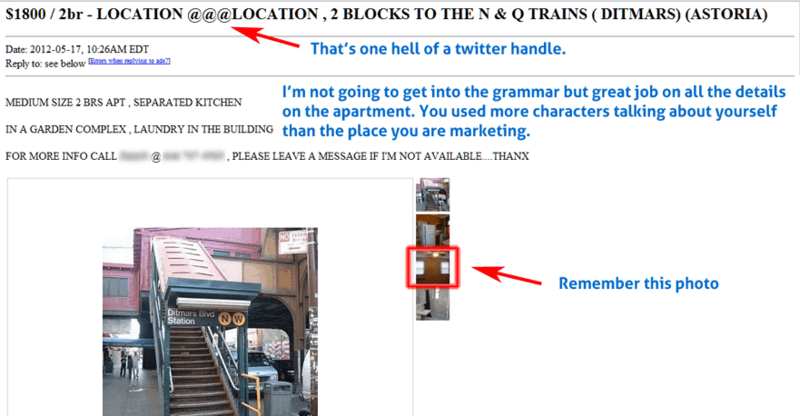 A funny thing about Craigslist is that they don’t charge owners to post their apartments in NYC, just brokers. Seemed like a smart idea at the time, right? Spoiler Alert: there are very few that I ever see in my result set that are no fee or by an owner. Most of them are by brokers that even say there is a fee – a direct violation of site policies but there are so many that do this it’s impossible to police them all. Brokers/Agents: How would you respond to your sellers/landlords that questioned you about how you are marketing their property after seeing these ads? Buyer/Rental Agents: How much of your time would be wasted with useless questions and qualification efforts if you put your ads in like this? How good could your leads be? 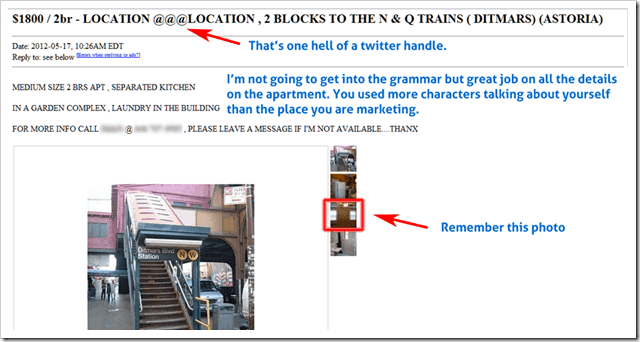 Sellers: Would you pull your listing from an agent or broker that gave you this level of marketing acumen? Buyers/Renters: Is this an acceptable level of marketing effort that you have come to expect in today’s competitive real estate landscape? Would you even respond to any of these ads? To be honest, as long as Craigslist allows this stuff to keep happening, people will trust the platform less and less – and the traffic will reflect that. I’m not suggesting that they become all draconian about who can post and who cannot but perhaps there should be some mechanism in place to make it harder to break those rules and some sort of penalty for doing so. After all, rules without penalty are rules that cannot be enforced. They fall under norms and values and business is not one for considering those things. What I recommend YOU do is take a look at who is posting things in a space you want to advertise in up on Craigslist and make sure your ads destroy theirs. If you are going to spend any money make sure it’s smart money. Invest in putting in some solid HTML code and host your own pictures. This will let you put them in anywhere you like in the add and do whatever you like with them. Good ads will waste less time, they will get you better leads and give you more credibility in that space. If you can brand your ads so that people know what they are getting within a second of seeing your ad (like maybe with your brand name in the title) then you are winning. They will trust your ads and they may even forward them to their friends to spread your efforts virally. Another nice little benefit is that you won’t end up on posts like this one making fun of anemic efforts in marketing. 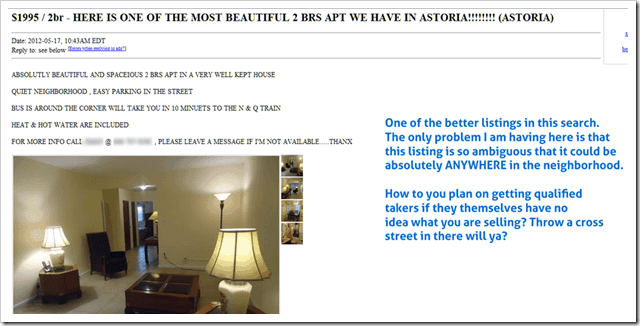 I have never paid for Craigslist – when did they start charging for Real Estate listings? I do know what you mean though – there is alot of strange ads – even when I try to search For Sale By Owners listed properties keep appearing and the ones that don’t identify their company makes it really confusing! This is why alot of Brokerages are pulling away from these advertising sites so as not to misinform the public. They only charge in certain areas. The big problem is that there really is no mechanisms in place to ensure people are playing by the rules put in place. To be honest, I can see how it’s only in the consumer’s best interest for everyone to play by those rules. I’ve seen several instances of people putting lots of fake ads up there in order to create more noise and frustrate the consumer. Appalling.